I have a tendency to become obsessed with certain artists/musicians/writers/actors and will for a period of time want to be them. I've always been like that since I was young and it seems to be a continuing theme. 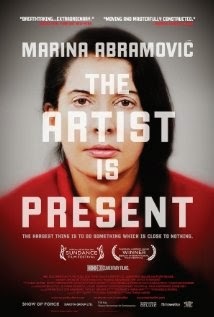 At my recent Wild woman event (which is a monthly book club I attend which includes some of the smartest wittiest women I've ever met) one of my fellow wild women recommended that I watch a documentary called "The artist is present" about a Serbian performance artist Marina Abramović. The documentary not only asks questions about what is art but also shows the preparations for Marinas show, the center piece of which sees her sitting for seven an a half hours a day without food or water. She is totally silent, a living breathing piece of art wearing long gowns of red, white and black whilst audience members come and sat opposite her. Peoples reactions to this beautiful still creature are so extraordinary, some laugh, some look puzzled and many weep as the silence makes them think about their own lives. 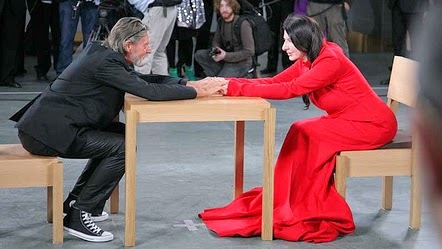 The most powerful moment for me was when her former lover and collaborator Ulay comes and sits across from her and a solitary tear runs down her cheek. Marina is also something of a style maven and I of course now want to be her which is where this outfit comes in.This is my wink to Marinas style. Sure its not a Princess Leila style dress but I definitely think its a passing nod to her vibe. I was sent this kimono by Pink Clove £20 and immediately decided it would be perfect for me to work into a homage to a Russian performance artist. I've put it with a simple black vest, leggings,tube skirt and classic black ballet pumps. I think the bright splashy flowers against the stark black look absolutely amazing. I've worn my hair to one side with just a few flowers pinned to my ear. The shape of this kimono is gorgeous, draping gracefully with beautiful bat wing sleeves. When casting around for style inspiration don't feel you can only turn to fashion magazines or the latest singers or models. I find ideas for colours, looks and styling from all kinds of sources and love putting together outfits which channel different eras, or people. One day I want to be Little Edie from Grey gardens, the next I'm Freida Kahlo, the following day I'm Miss Piggy. Clothes are such a great way to express yourself so if a current trend or style bores you, ignore it and create your own fashion dream. Walk to the beat of your own fashion drum.Its a great tune and you will never bump into someone wearing the same outfit.